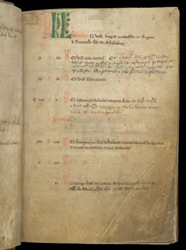 A calendrical martyrology is used to record people's names and the dates of their death, so that their souls can be prayed for on each anniversary of their death. Gaps are left for the later insertion of more names. The earliest entries in this one (written in a small regular gothic script in brown ink) consist of 'Co.' (commemoration of ...) followed by the name. At the top of this page are William Bungay of Chesterfield, followed by Roger de Baucewell, a slightly later addition.